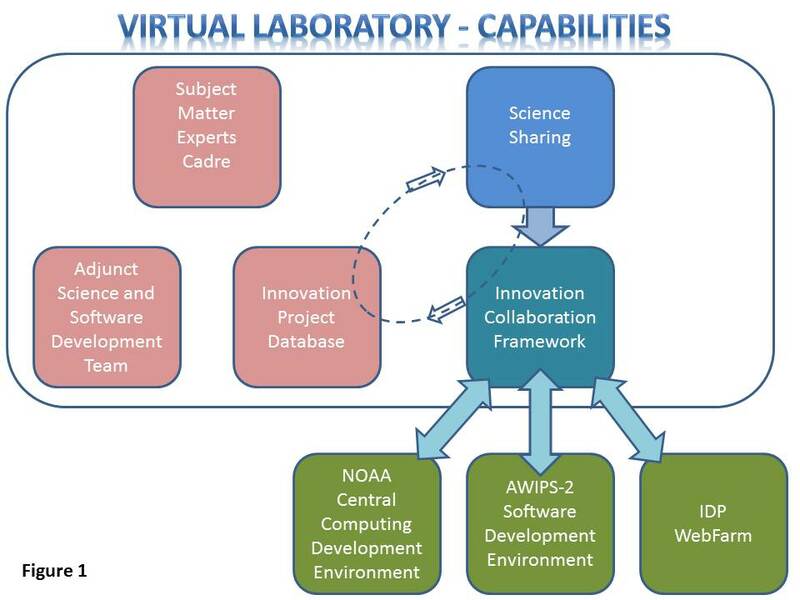 The VLab is built upon a set of 5 foundational capabilities (Figure 1) which are conceived to promote innovation across NWS through communication, collaboration, and the application of the skills and expertise of NOAA employees. The first phase of the VLab promotes science sharing within the NWS and provides an Innovation Collaboration Framework which provides support and services to facilitate the transition of innovation projects to NOAA operational systems. The second phase of the VLab will provide the other three foundational capabilities; 1) subject matter experts cadre, 2) adjunct science and software development team, and innovation project database. The VLCS is built upon an open source Java portal framework. The VLCS enables NOAA users to share and contribute science and participate in dynamic communities. The VLCS provides tools for collaborating such as document libraries, WIKI's, message boards, blogs, announcements, dynamic forms with workflow, content management system (CMS), and a robust roles and permissions framework. The VLCS is also the gateway to the VLDS. The VLDS provides projects with web based services to manage their projects through issue tracking, source control, code review, and continuous integration. Page last Modified: December 05, 2014.